Perinatal depression is depression that happens during pregnancy or in the first year after having a baby. It’s the most common complication of pregnancy. It affects about 15 percent of pregnant women. Untreated depression during pregnancy can cause problems for your baby, like premature birth. When depression happens after giving birth (called postpartum depression), it can make it hard for you to take care of yourself and your baby. 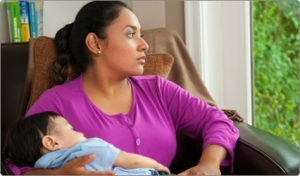 Last month, the U. S. Preventive Services Task Force (also known as USPSTF) made recommendations about ways to help prevent perinatal depression. This is a great step for moms! Preventing depression can help moms and their babies have a healthier life. And the recommendation increases access to care for women. This is because under the Affordable Care Act, USPSTF recommended services must be covered by health insurance without any additional out-of-pocket cost. The USPSTF says that women at increased risk of perinatal depression can benefit from certain kinds of counseling (also called therapy) to help prevent it. Counseling is when you talk about your feelings and concerns with a counselor or therapist. This person helps you understand your feelings, solve problems and cope with things in your everyday life. Cognitive behavioral therapy (also called CBT). CBT helps you manage negative thoughts by changing the way you think and act. Common kinds of CBT include working with a therapist to help you set goals and identify negative thoughts and behaviors so you can begin to think and act differently. Interpersonal therapy (also called IPT). IPT helps you identify and deal with conditions and problems in your personal life, like relationships with your partner and family, situations at work or in your neighborhood, having a medical condition or losing a loved one. Common kinds of IPT include working with a therapist in role-playing, answering open-ended questions (not yes or no questions) and looking closely at how you make decisions and communicate with others. If you’re at increased risk for perinatal depression, your provider can help you get treatment with CBT and IPT. Be honest with your provider about your life, your pregnancy and your feelings so your provider can help you find counselors for treatment.